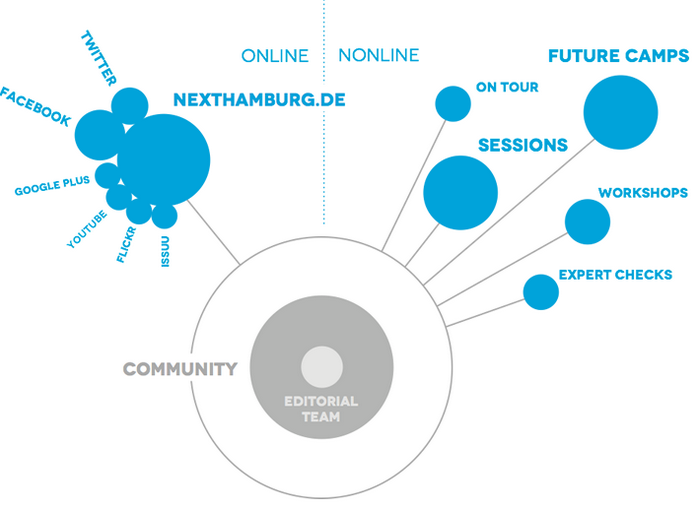 Next Hamburg is an independent think-tank for future urban development in Hamburg. The project relies on the voluntary cooperation of citizens and local experts and work through cooperation mechanisms of Internet community, such as “crowdsourcing” or “Crowd Wisdom”. The ideas of the citizens here give a stimulus to be held in Hamburg urban development discussion. The project has the target to activate local Citizens for urban development. Next Hamburg argues that every citizen can contribute to urban development by expressing and discussing ideas and eventually can initiate a reaction. The possibilities and potential of the Internet are used significantly. “Crowdsourcing”, is the generation of themes and content by mass in the Internet, as well as “Crowd Wisdom”, the solution of problems through collective knowledge is explicitly formulated as a strategy of participation. Urban development is thus initiated by the mass. This is called a “bottom-up” processes. The knowledge, opinions and ideas of the citizens of Hamburg are channelized by Next Hamburg and are prepared for real urban development projects. In a further step, the “crowd Casting”, experts from various disciplines are integrated. By formulating a clear problem more targeted activation of relevant experts is achieved in the user community.